TGCET Exam date, Hall tickets, Instructions for TG Gurukul CET (5th class Entrance Test) 2019. TGCET Hall tickets 2019 are available. Telangana TG Gurukul CET 2019 Hall tickets for TS Residential Schools 5th class entrance test. Telangana Gurukul CET 2019 notification has been issued by the Telangana Government and Online applications were received from 18-02-2019 to 15-03-2019 through TGCET Web portal. 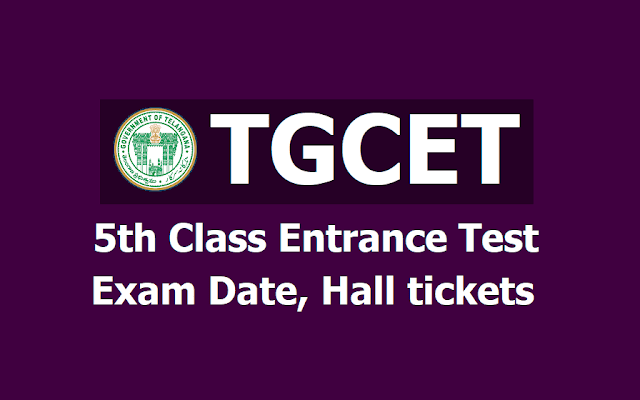 The candidates who were applied for this common entrance exam, they can download their hall tickets from the tgcet,cgg.gov.in website after submission of online application form with the use of following details. Step 3: Telangana Gurukul CET 2018 Official page will be displayed. 1. The Student Should bring bonafide certificate from the Principal / Head Master concerned, where the student has studied 4th class during the academic year 2018-19 at the time of admission. 1. ప్రవేశపరీక్ష వ్రాయు అభ్యర్థులు తమకు నిర్దేశించిన పరీక్ష హాలులో కేటాయించిన స్థానంలో ఉదయం 10:30 ని||లకు తప్పనిసరిగా ఉండాలి. పరీక్ష ప్రారంభానికి ముందు ఓ.యం.ఆర్. (OMR) సమాధాన పత్రాన్ని నింపు పద్ధతిపై పరీక్ష హాలులో ఇన్విజిలేటర్లు అభ్యర్థులకు పూర్తి అవగాహన కల్పించుటకు ఏర్పాటు చేయడమైనది. కావున అభ్యర్థులు నిర్ణీత సమయానికి ఒక అరగంట ముందుగా పరీక్షా కేంద్రానికి చేరుకోవలెను. ప్రవేశ పరీక్ష (తెలుగు / ఇంగ్లీష్) మాధ్యమాలలో ఉంటుంది. 3. ఓ.యం.ఆర్. (OMR) సమాధాన పత్రంలోని వృత్తాలను బ్లూ / బ్లాక్ బాల్ పాయింట్ పెన్నుతో మాత్రమే పూరించాలి. ఒక ప్రశ్నకు ఒక జవాబు మాత్రమే నింపాలి. 4. ప్రశ్నా పత్రంలో ఇచ్చిన బుకీలెట్ సీరిసని తప్పకుండా ఓ.ఎం.ఆర్.లో నింపవలెను. 5. ఒక ప్రశ్నకు ఒకటి కన్నా ఎక్కువ వృత్తాలను నింపిన అట్టి జవాబులకు మార్కులు ఇవ్వబడవు. వృత్తాలను అసంపూర్తిగా పూరించిన జంబులకు మార్కులు ఇవ్వబడవు. 6. అభ్యర్థులు పరీక్షకు వచ్చినప్పుడు బ్లూ / బ్లాక్ బాల్ పాయింట్ పెన్ను తప్పక తెచ్చుకోవలెను. 7. ఓ.ఎం.ఆర్.లో పేరు, తండ్రి పేరు, కేటగిరి, పుట్టిన తేది మొదలైన వివరాలు సరిగా ఉన్నవా లేదా సరిచూసు కోవాలి. యెడల వాటిని పరీక్ష హాలులో ఇన్విజిలేటర్తో చెప్పి తగిన పత్రాలు చూపించి ఫోటో నామినల్ రోలులో సరిచేయించుకోనవలెను. 8. హాల్ టికెట్ ను డౌన్ లోడ్ చేసుకుని, అన్ని వివరాలు క్షుణ్ణంగా పరిశీలించుకోండి. మీ పరిక్షా కేంద్రం తెలుసుకొన్న తరువాత ఆ కనీసం ఒక రోజు ముందుగా వెళ్ళి చూసుకొని, పరీక్ష నాడు తగు రవాణా ఏర్పాటు చేసుకొనవలెను. పరీక్షకు ఆలస్యంగా హాజరుకావడం అనుమతించబడదు. 9. అభ్యర్థులు పరీక్షకు వచ్చినప్పుడు తప్పక పరీక్షాప్యాడు తెచ్చుకోవలెను. * Duration of exam is 2 hrs. * Students have to fill your answers in OMR sheet are given in Prospectus. * Exam will be in Telugu, English & Urdu Media. 1. Each Question carries 1 mark. 2. The Question Paper consists of Five parts. Part A - 25 Marks (Q. No. 1 - 25) - English. Part B - 25 Marks (Q. No. 26 - 50) - Mathematics. Part C - 25 Marks (Q. No. 51 - 75) - Environmental Science. Part D - 20 Marks (Q. No. 76 - 95) - Telugu. Part E - 5 Marks (Q. No. 96-100) - Mental Ability. 3. Before you begin to answer, fill in the necessary particulars and sign on the OMR sheet, failing which the script will not be valued. .
4. You are prohibited from writing your name and register number on any part of the OMR sheet. 5. In case, your Hall Ticket Number is not printed on the OMR sheet, write it in the box provided in the OMR sheet itself. 6. You are prohibited from bringing loose sheets of paper or books, written or unwritten, printed, typed or cyclostyled into the examination hall. 7. Choose the correct answer and darken the relevant circle in the OMR sheet with a Blue / Black ball point pen. 8. Candidates are NOT permitted to leave the Exam Hall till the last 10 minutes. Candidates are advised to follow the instructions given below. If you do not follow the instructions, your OMR answer sheet will lead to invalidation. 1. Before you start answering, please check your Name and Hall Ticket Number are printed correctly or not in OMR sheet. Please contact the Invigilator if the information is incorrect / missing. 2. Use blue / black ball point pen only for bubbling / encircling while answering the questions. 3. Write and Darken / Bubble the Question Booklet Series in the place provided in OMR sheet after taking the question paper from the Invigilator ( Very Important). 4. Four options A, B, C, D are provided for each question. Mark the correct answer by darkening the appropriate circle fully by using blue / black ball point pen only. 5. Once answered by darkening the circle, no change / alteration is allowed. Do not use eraser, ink remover or other methods to alter the answer and do not spoil the OMR sheet. 6. The answer sheet will be valued through scanning machine, which scans the darkened / empty circles. Hence, take utmost care in darkening the appropriate circle correctly and completely. 7. If more than one circle is darkened for one question, the answer will be treated as wrong. 8. Do not fold, tear, wrinkle, tie or staple the OMR answer sheet. 9. Do not do any rough work or make any stray marks on the OMR answer sheet. TGCET 5th Class Entrance Test Hall tickets: TGCET Hall tickets 2019, TS Gurukul CET Hall tickets 2019, TG Gurukul CET Hall tickets 2019, Telangana Gurukul CET Hall tickets 2019, V Class TGCET Hall tickets 2019, 5th Class Entrance Test Hall tickets 2019, Telangana Gurukulam Common Entrance Test Hall tickets 2019, TREIS TSRS 5th Class Entrance Test Hall tickets 2019, TSWREIS 5th Class Entrance Test Hall tickets 2019, TTWREIS 5th Class Entrance Test Hall tickets 2019, MJPTBCWREIS 5th Class Entrance Test Hall tickets 2019, TS Social Welfare 5th Class Entrance Test Hall tickets 2019, TS Tribal Welfare 5th Class Entrance Test Hall tickets 2019, TS BC Welfare 5th Class Entrance Test Hall tickets 2019, TS Residential Schools 5th Class Entrance Test Hall tickets 2019, TS SC Gurukul CET Hall tickets, TS BC Gurukul CET Hall tickets, TS ST Gurukul CET Hall tickets, TS Gurukul CET Hall tickets.